DESCRIPTION Bright orange and royal blue markings on this beautiful butterfly from the family Nymphalidae. Mostly living in the forest canopy the adults venture down to feed on rotting fruit or decomposing fish. 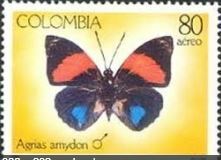 There are many variances in colourations on these gorgeous South American butterflies some say the Gems of the forest. A must for collectors. Set in white matt board. Strictly limited item.